Frankly, I’m never sure what to call this watch. The Deepsea? The Sea-Dweller Deepsea? 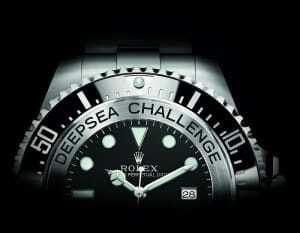 The Deepsea Sea-Dweller? 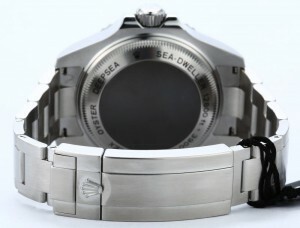 The dial carries both signatures, and the Rolex website includes it alongside the Sea-Dweller 4000 under the SeaDweller tab. 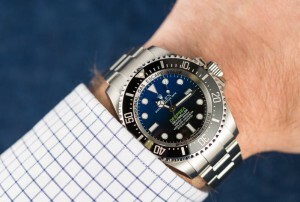 But when you get there, the page’s title appears to be Rolex Deepsea. The extra parts have to do with, you guessed it, sealing the Deepsea from additional external pressure. But it’s not just seals and gaskets. The fundamental structural philosophy is different for each watch. In the Submariner, the crystal is sealed to the case by a gasket. Structurally, the crystal bears on an internal lip of the case. The one-piece case back is sealed the conventional way, with an O-ring. It simply screws into the back of the main case. In the Deepsea, the seal between the 5mm thick crystal and the outer case is a two-part system with interlocking conical pieces – one polymeric and one titanium – oriented in such a way that external pressure forces them ever more tightly together. But, while the crystal/case joint is indeed sealed as described, the crystal bears structurally on a separate internal piece called the compression ring. Now, you may not realize it, but if you know the Deepsea, you know the compression ring. It’s perhaps the watch’s most visually distinctive feature – and perhaps its most controversial. You see, the compression ring is the ring which surrounds the dial and bears the words, “ORIGINAL GAS ESCAPE VALVE” and “RING LOCK SYSTEM.” And you thought that was all marketing hype and showmanship. Well, the printing may be, but the part it’s printed on is vital to the structure of the watch. It’s actually captured inside the case and also acts as the movement ring. The case back is two-piece. The back itself is a machined disc of titanium which takes the pressure loading. The other piece is a tightening ring which clamps the back to the case. This is Rolex’s patented Ringlock system. It’s an extremely efficient system for sealing against high pressures. The two-part design dramatically reduces the possibility of warp-induced leak paths, should extreme pressure cause the back to deform. The back component which takes the pressure loads is of course, the structural element. Like the crystal, it also bears on the compression ring, from the opposite side of the watch (held in place by the tightening ring). This creates opposing forces due to external pressure that largely cancel each other out. This canceling minimizes the chance of the case warping, which would potentially compromise the seals and allow the watch to be flooded. In fact, the separate external case really doesn’t suffer pressure loading nearly as severely as the crystal and the case back. To greatly simplify, it’s the component that holds all the other components together while they do all the work. 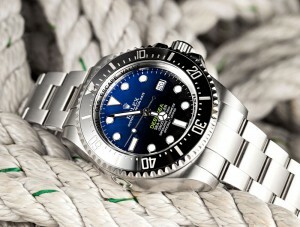 All in all, the Rolex Deepsea is a marvel of modern underwater engineering. Not at all just another pretty – albeit beefy – face.